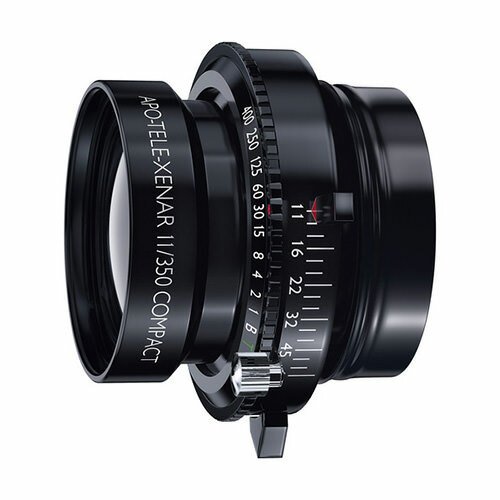 Lens Description: The APO-Tele-Xenar Compact 350mm f/11 Lens with a Copal #1 Shutter from Schneider Optics is a superior-quality lens delivering an image circle of 350mm, the perfect choice for professional and amateur photographers with 4 x 5\", 5 x 7\" and 8 x 10\" field cameras. The lens is compact (2.4\", 60.4mm) and lightweight (14.1 oz, 400 g). Even at maximum aperture this fully symmetrical four elements lens, with Apochromatic correction, exhibits excellent reproduction performance and has outstanding resolution and contrast.